In the emergency room on that scary night last July, she wasn’t. She’d stopped breathing only minutes after she got to the Level I Trauma Center at Memorial Hospital Central. Dr. Daniel Valentino, a skilled trauma doctor, brought her back. Jasmine Porr had to be revived twice after she suffered a severe head injury. She wore a helmet for several months to protect her head. Porr said she wasn’t being the smartest teenager that night. Without permission, she’d taken her father’s car, picked up a couple of people she no longer calls her friends, and went for a joy ride. While parked near Mitchell High School, she and another kid were sitting on the back of the car, when a third punched the gas pedal. Jasmine hit the back of her head so hard, she started having seizures. Blood poured from her head, yet the people she was with did not know what to do. One of them called Jasmine’s sister, who raced to the parking lot. By the time an ambulance got Jasmine to Memorial a little after midnight, her brain had swelled so much that it caused her heart to stop. After Valentino resuscitated her, doctors gathered around the family. Jasmine’s dad, Michael; her mom, Sunny and stepmother, Stephanie, were told that the traumatic brain injury Jasmine had suffered was among the worst they’d seen. Dr. John McVicker, medical director of neurosciences at Memorial, looked over her CT scan. That was not her only head injury. 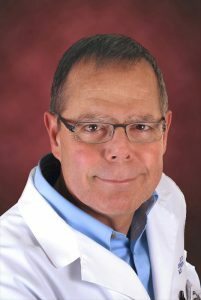 Dr. John McVicker, a neurosurgeon and director of Neurosciences at at UCHealth Memorial Hospital. “Indeed, when you hit one part of your head, the brain slams on the inside of the skull on the opposite side, called coup contrecoup. So, she had injury to the front part of her brain as well,’’ McVicker said. She needed surgery, immediately, to relieve the pressure on the back of her brain. Before he scrubbed in for what would be a 4.5-hour surgery, McVicker told the family that Jasmine, 17, could die in surgery. Michael said he felt “frozen.’’ The hours in the waiting room outside the operating room were excruciatingly slow. “He said prior to her going in that she could not make, she could die. And waiting for him to come back out and say if she made it or she didn’t, it felt like an eternity,’’ he said. 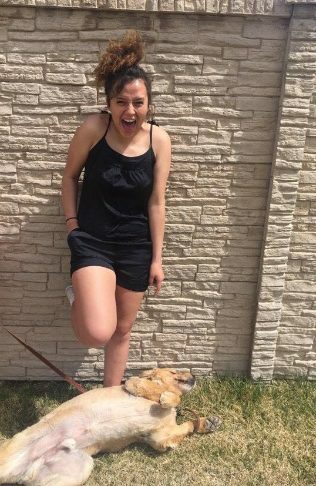 Jasmine Porr, shown with a dog, before she suffered a severe brain injury. Behind the doors of the operating room, McVicker and his team went to work to relieve pressure on Jasmine’s brain. During the surgery, Jasmine coded again. The doctors revived her. As the sun rose that morning, a nurse called to the waiting room to speak with Michael. Jasmine had made it through surgery. McVicker had removed blood that had pooled near the brain stem. She wasn’t by any means out of the woods. She went to the intensive care unit but McVicker had concern about additional swelling in the front of Jasmine’s brain because of the countrecoup injury. He needed to take her back to the operating room to allow room for the front of her brain to swell. 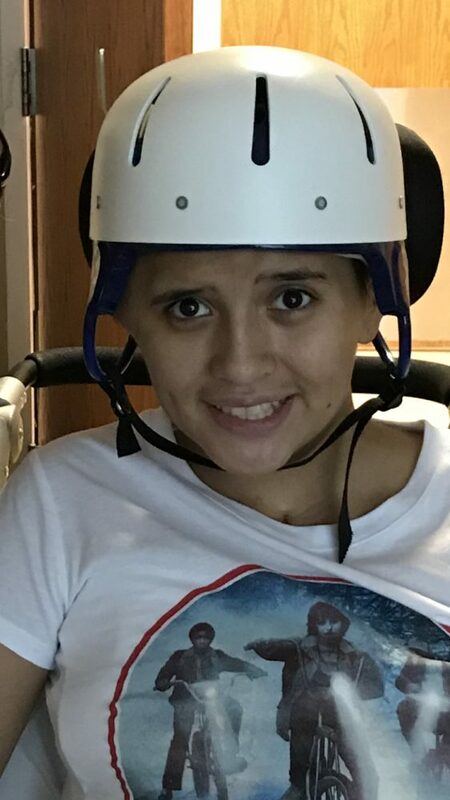 After surgery to remove nearly the entire right side of her skull, performed by Dr. Ricky Medel, a UCHealth neurosurgeon, Jasmine went back to the ICU. She lie motionless, cocooned in tubes, monitors and 15 to 20 different IV bottles with different medications that kept her alive. When he remembers those days, Michael says only that it was hard to watch. Every day, a flurry of doctors, nurses, social workers, respiratory therapists – you name it – came to Jasmine’s ICU room, each doing their part to keep her alive. Michael Porr, who has a background in healthcare, lived at Memorial Hospital during those days. Jasmine Porr sports a white medical coat during a return visit to UCHealth Memorial Hospital Central. 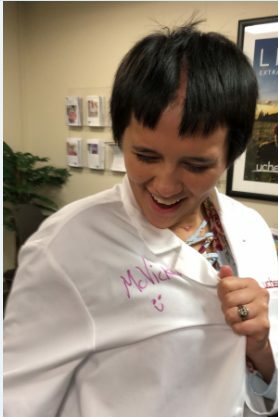 Her neurosurgeon, Dr. John McVicker, autographed the coat. Slowly though, as machines beeped and burped, Jasmine began to show small signs of life. She moved her arm, and then wiggled her toes. She regained consciousness. With each day, Jasmine made progress, though Michael, having a medical background, wondered about the long-term for Jasmine. Would she be able to talk and walk? Michael brought an electronic tablet to her room, and pulled up a blank page, and handed it to Jasmine, who began to type. “I’m so sorry Dad,’’ she wrote. Jasmine doesn’t remember any of it. Her recollection of her hospital stay begins in Memorial’s Inpatient Rehabilitation Unit on the seventh floor of Memorial Hospital Central, where she learned to walk again. On Aug. 25, wearing a helmet to protect her head, which was still missing her right skull, Jasmine went home. She had lost the sight in her right eye from the impact to her head. Jasmine enrolled in online courses through Colorado Springs School District 11, and in the fall semester, she did something she had not done before. She earned straight A’s. More than two months after leaving Memorial, McVicker did another surgery to replace Jasmine’s skull, which had been in the freezer since the day after the accident. She knows how fortunate she has been and has a message for other teens. She had eye surgery in October, which restored vision to 20/20 in both eyes. “What I’ve learned is it is all fun and games and you may not care. You may want to live your life on the edge, and it’s all fun until you actually do get hurt or you actually do lose your life. It can happen to anyone,’’ Jasmine said. 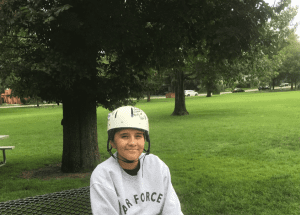 Jasmine Porr wore a helmet for several months to protect her brain. She said she appreciates the many people in her church community who offered prayers and support and for the doctors who intervened: Valentino, Reckard and McVicker. “Dr. McVicker is my hero. He saved me twice and he’s been a great person in my life. In rehab, I had nurses who I made friends with. When they had to watch me overnight, we communicated so well, and the food is not bad,’’ she said. She has been discharged from occupational and physical therapy. She is becoming more independent every day. After she graduates from high school in the spring, Jasmine plans to pursue a career in pediatric nursing. “I know that people all have their own lives, but I want people to be able to keep their lives. I want to be able to save people, to give them medicine, to just help them, the ones in need. Erin Emery is a writer for UCHealth and is based in Colorado Springs.